Today has been slightly calmer thankfully. After getting up in a rush to get ready, J and I were offered a lift to school by J's Grandma, which was a boon. So we were able to have a leisurely breakfast. Myself and C went into town afterwards to ask the mechanic to continue with works on the car - groan, no Christmas extras for us this year!! Why do car's always breakdown when you REALLY don't need them to?? Anyway enough moans and groans. We ran a few errands and then went back to the house. Weather-wise, it has been gloomy, overcast and a little light rain, also rather chilly, even the locals were saying it was 'muy frio'! Not as cold as the UK me thinks!! All is quiet at the mini farm here. Our other turkey is quiet but pops out to chat whenever I check on her, she seems happy enough and is eating, so doesn't seem too lonely without her previous companion. The rooster is doing his very best to make the hens lay! The cats are snuggled up somewhere, sleeping as much as possible and the dogs are playing, sleeping and messing about in the yard. So not much to report here today except the oranges and mandarins are almost ready for picking. We also have two trees of olives that need harvesting but so far we've had no time. Perhaps tomorrow morning!!! I need to find a large amount of salt so we can get them in water to mature. You cannot eat them straight off the trees. 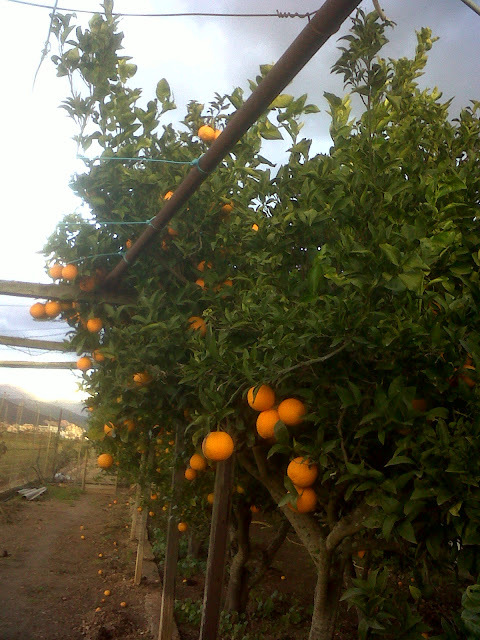 There doesn't look like many oranges etc, but the trees are laden - whooohooo, more marmalade please C.
Here in Mallorca I find that whenever you plan something, another 'thing' stops you from doing it - temporarily anyway. There is now a large crop of potatoes growing one side of us, the other side of us has an enormous field of lettuces and opposite us a field of artichokes, so all the farmers are busy with their crops. Ours are coming on, but because of the cold they are a little slow to grow. J has done his nativity scene and I have a log fire roaring to warm things up a little. I expect Ruffa will come in to warm himself for a bit soon.